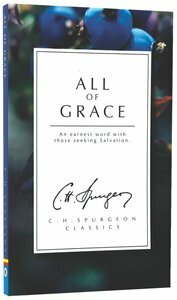 About "All of Grace: An Earnest Word With Those Seeking Salvation (Ch Spurgeon Signature Classics Series)"
This book is a classic! Perhaps because it is on a great subject, or perhaps because of the author - one of the greatest preachers who ever lived. It has been written to show clearly how much we all need grace and how much grace is available for our needs. The writer would like to compel us by his words to come to Jesus Christ and receive that grace. Many consider Spurgeon to be probably the greatest, and most influential, preacher that Britain has ever produced. Thousands flocked to his church every week at the turn of the 20th Century. Millions have since read his words through his sermons and books in print. It is a fair assumption that Spurgeon has had more of his words published than any other Christian Minister. Why? because Spurgeon is direct, clear and concerned about his readers. Here is the foundation of Spurgeon's ministry - his desire to see people come to trust Jesus so that they can spend eternity with God in heaven. It is a personal, passionate plea to you to consider where you are spiritually and the consequences of that. Spurgeon points you to how Jesus can provide security against your moral failings in front of a holy God, whom one day you will meet. Book jacket.